CDC421 is a high-performance, low-phase-noise Clock Generator It has an integrated low-noise, LC-based Voltage-Controlled Oscillator (VCO) that operates within the 1.75 GHz-2.35 GHz frequency range. It has an integrated crystal Oscillator that operates in conjunction with an external AT-cut crystal to produce a stable frequency reference for the PLL-based Frequency Synthesizer The output frequency (fout) is proportional to the frequency of the input crystal (fxtal). The device operates in a 3.3 V supply environment and is characterized for operation from -40C to 85C. CDC421 is available in a QFN-24 package. This is one package pinout of CDC421156,If you need more pinouts please download CDC421156's pdf datasheet. 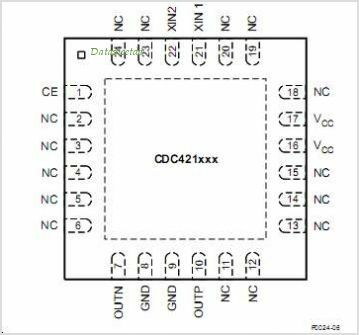 This is one application circuit of CDC421156,If you need more circuits,please download CDC421156's pdf datasheet.